Soft Mesh Harness that is light weight and air breathing. A perfect harness for hot weather. The Soft Mesh Harness identifies the small working dog with this professional looking harness. It is a harness that gives you control and comfort for the dog at the same time. The top fabric of the harness is made mesh and is lined with soft netted fabric. Both neck/chest and girth have hook & loop closures and side release buckles for secure closing of the harness. There is a reflective web strip around the girth of this harness. There is a D-ring on the back of the harness for the dog’s leash. 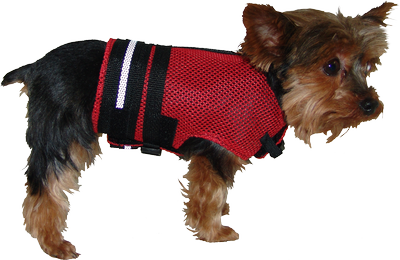 This Soft Vested Harness comes in 4 sizes. The color choices are Black, Blue, and Red. Comes with two regular 1.5”x3.5” patches of your choice. The front chest strap is made of elastic material.